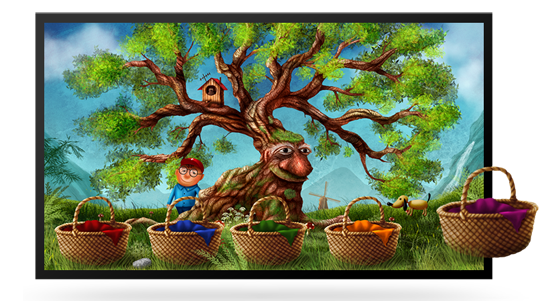 Hello everyone, welcome to part 2 of our blog on educational gaming and the art of gamification. Last week we looked at some simple principles of the idea, and today we're going to look at educational games. If you, like me, are in your mid twenties you'll probably have experienced this first hand. If you're older with children, its possible you may have purchased some form of educational game for your own children. Of course, as a child, we always seemed to be able to smell educational games a mile off and more often than not rejected them outright over alternate titles. 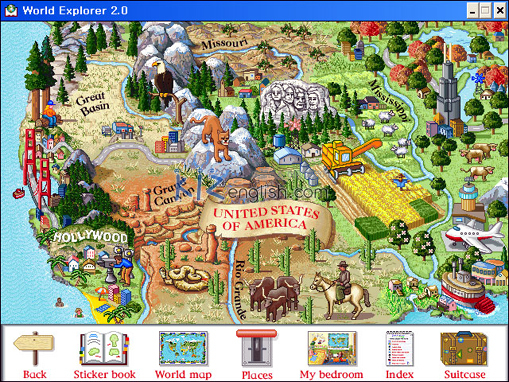 My first experience with such a title was at around the age of 6 or 7 on windows '95 with DK World Explorer. And actually, it was pretty good fun for everyone involved. It ran as a colourful and inviting atlas with a small amount of game involving chasing someone around the world from the clues left to you from letters. Now, sadly, the game didn't run very deep, so to speak. Essentially, beyond the clicking about around the map, you were limited to basically reading small paragraphs about each different area you click on. Of course, at the time this was more or less the only game I had available to me (especially true after I had scared myself away from Lego Island after letting “The Brickster” out of jail, but I digress) and I feel this was probably the key element in what kept me plugging away at completing my passport. As I got older more and more options became available and educational gaming just couldn't compete. It's a wonder I ever went abroad after seeing cats the size of mountains. One of the huge misconceptions that is made time and time again across industries is thinking that making a product for a child means it doesn't need as much polish or effort as the same product made for teenagers or adults. As a result there were always a slew of low quality – but cheap – products available in my youth. There was always a big stand of 3 for £10 games but you always had an exceptionally hard time getting to the total three you wanted given that while you had the occasional “Dungeon Keeper” or copy of “Civ II” (Not that Id have appreciated Civilisation at my age) you had to search for them among dozens of variations of “How to count!” and “Spelling is fun”. Inherently there is nothing wrong with maths and spelling games, but the low budgets for these games raised loud warning signs that even as kids we picked up on, from the covers alone. We didn't want to play those games. Even if our parents bought them for us, we had “Earthworm Jim”, we had “Thief”. Now days, where it is almost impossible to find a place with no phone signal, where a phone made 5 years ago has enough memory to hold all of the games from my childhood, where we have internet videos, television, games and apps all competing for a child's attention – and their limited free time – educational games in the old format are less appealing than they have ever been. So, how can we deal with this problem. Companies have taken different approaches, but there seem to be two main valid responses: We either use the old methods, but focus far more heavily on the quality of game we put out or we instead hide the education within games. Examples of the first case include such titles as “Big Brain Academy” and “Jumpido”. By maintaining the educational element as key in the branding, these games are able to maintain a strong connection with the fundamental idea of educational gaming. By being fundamentally educational you ensure that you know exactly what is being taught within these games (for BBA, logic and reasoning, for Jumpido, Primary school maths) which is a big advantage over the other approach. Given you know exactly what you are teaching here, it is easy to surround the product in other resources to reinforce the lessons learnt. When we are looking for examples to use in classrooms or for tutors, these are the sorts of games we want to be looking at. Strong and unique art direction can help set one educational title apart from the next. The second approach is a far sneakier one and relies on teaching without us realising we are being taught. Almost everyone will have come into contact with a droll game that aims to teach us wonderful spelling (the one I recall being The Jungle Book themed) and the fact there are so many variations makes it clear how easily repeatable the formula is. However, there's a fantastic range of games out there that teach spelling as part of the core game-play of the product - “Scribblenauts”. The adorable concept here being that a child and his magic pencil are tasked to solve problems by being able to create almost anything in a colourful cartoon world. How do you create your problem solving pieces? Well, you simply have to write the word down. It is as ingenious as it is simple, but does a spectacular job at making this a fun part of the game, without being core to the experience. This, in fact, is somewhat the norm among highly popular games for younger audiences. There's vast quantities of data about how valuable “Minecraft” can be in teaching things ranging from logic gates, maths and resource management. I won't go too far into this though, there's more than enough content on this already. 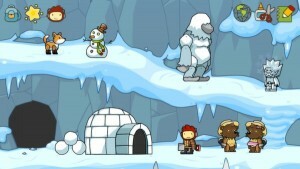 The Scribblenauts series teach through exploration with massive amounts of personal freedom. Ultimately, there is no right way to approach education in gaming, but a key part to think about is why gaming is inherently so appealing. Both have their place and fit different roles in the current sphere of educational gaming. What will work best will depend on the situation you're trying to educate in, but the key element across both if the game has to be independently engaging. If someone is forced into playing a game the appeal of the game rapidly disappears, so the quality of the game needs to be high enough that it works as a game first. If it doesn't then we'll miss out entirely on the one key element that lets educational gaming work so well.